You should contact the NOC team. Anchor maintains a few points of presence (POP), one of which is our headquarters in the Sydney CBD. Anchor has an AS number, it's 18020. This is used for our BGP routing and lets us get on the interwebs. Anchor has multiple connections to the outside world at each POP for redundancy. If a connection fails (eg. backhoe causality incident) we still have connectivity. Routing protocols handle the failover for us, resulting in a minimum of downtime. Routing also gives us some flexibility in addressing, as we can advertise chucks of address space from each POP where it's in use. BGP is primarily an exterior routing protocol, between autonomous systems. 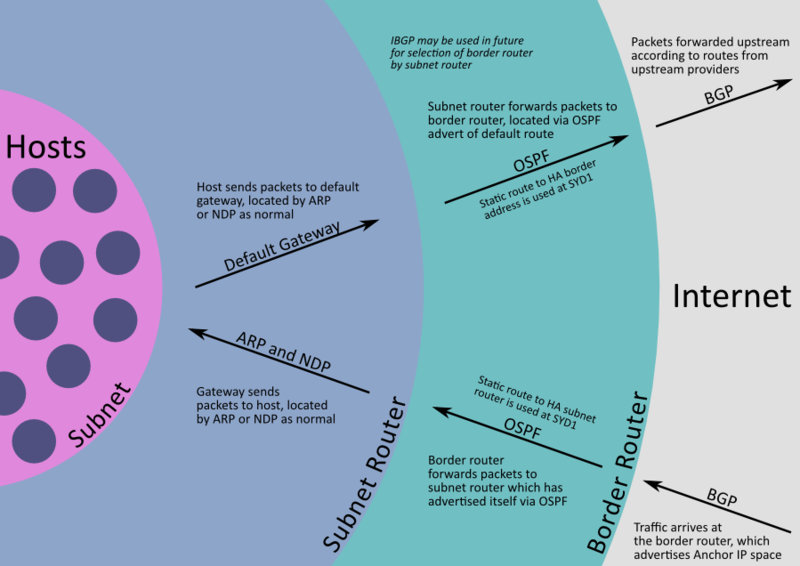 BGP is also often used inside an AS so that border routers can have a consistent picture of connectivity to the outside world. When used in this way it's called IBGP (Interior or Internal BGP). The border routers at each POP advertise part of Anchor's address space to the internet, via our upstream providers at each POP. The border routers are referred to as "BGP speakers", and BGP is spoken along the cyan-coloured links in the diagram above. Roughly, "this /24 will be used at that POP"
As the advertisement propagates to the rest of the world, the address space will become reachable and traffic will arrive at the POP. Note that a given chunk of address space (eg. a /24) can be advertised from multiple POPs. This is not a problem, so long as traffic can be correctly routed to its destination once it's inside the AS. We already have an interior routing protocol (OSPF), so why do we need to use BGP internally as well? We run IBGP in a limited fashion within our AS, it basically gives border routers options for egressing the AS. At the time of writing, IBGP is used almost exclusively within each POP, and is not represented on the diagram above. This is a generic example of why IBGP is useful. We do not use IBGP » like this « like this though. We use OSPF to get packets between POPs. The alternative is to maintain static routes at each POP, which has substantial management overheads and would be error-prone. OSPF routers are always "adjacent" to each other. In an ideal world this would be a direct fibre connection. The harsh reality is that we use VPN tunnels between POPs, as described in the next section. These are the pink-coloured links in the diagram above. At the time of writing, we're not doing this but it's on the cards for the future. Advertising subnets "up" to our border routers. We use tunnels to carry inter-POP traffic. This is fantastic because it allows our privately-addressed networks (RFC1918) to be accessed from anywhere in the Anchor network. On the downside, it means we need to be careful when allocating new privately-addressed networks. We use OpenVPN and IPsec tunnels depending on the available networking infrastructure at each POP. Use of OSPF between POPs means we can run a full mesh of tunnels if we want to, and everything should keep working in the event of failures. Fukken <x> how does it work! ?